I have many death metal albums, but not even one by Disbelief, so this their 8th will be the first one. The four-piece from Germany have situated themselves in a position somewhere in the middle of all the death combo's. Their music is aggressive, heavy, has fast parts but also a lot mid-tempo parts. The vocals of Karsten Jäger are real growling and grunting death vocals, they remind me somewhat of Dan Swanö in early Edge of Sanity years. Musically they mix Gothenburg parts with Bolt Thrower and add some slow grooving riffs now and then. They have lots of variety in their songs, that's why it keeps interesting during the whole album. Most experimental song is "Demon's Entry", a rather epic song - compared to a lot of other death metal albums there is nothing wrong with 'Protected Hell', but it isn't a real top album either. Nevertheless, it is an album that will give the death metal fans many hours of pleasure while listening to it. 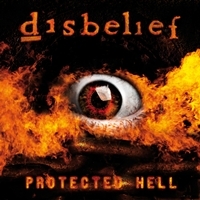 Real die-hard Disbelief fans should try to score the Limited Digipack with a bonus DVD (approx. 100 minutes playing time). Recommended songs: "Hell Goes On" and "One Nation's Son".